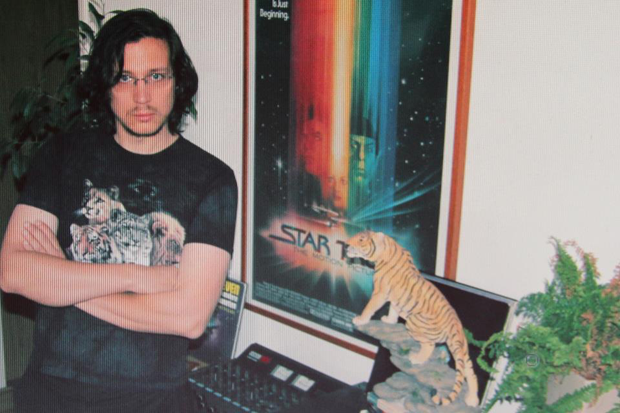 Legowelt, a.k.a., Danny Wolfers, is a prolific sort. Slogging away in his studio in the Hague, surrounded by some of the finest (and sometimes buggiest) analog music-making implements known to humankind, he can bang out old-school synth-and-drum jams with the ease of the late Christopher Hitchens reeling off a 1,500-word diatribe about Henry Kissinger, somewhere in between the third and fourth glass of wine. Not that Wolfers necessarily imbibes with the gusto of Hitch, nor ascribes to any of his polemical ideas — merely to say that the Dutch producer’s prodigious output means that he can afford to give away some of the goods, every now and then. “Deep Space Gazing” is a less contentious proposition. Wolfers describes it as “old school U.K rave proto breakbeat techno” sourced from the Commodore Amiga, Roland R-8, and Roland MKS-100, and while I’m in no way capable of verifying his gear list — I had to look up the MKS-100 — he’s certainly got the description down pat. With a vibe evocative of 808 State, Baby Ford, and early Warp releases, it feels like raving your face off in a remote field deep in the U.K. countryside, complete with an omnipresent layer of tape hiss settling in like frigid dew around your up-all-night feet. It’s lo-fi, hi-concept, and comes with a “mandatory” Star Trek sample. Get the goods from www.legowelt.com; check out The TEAC Life while you’re at it, and then send him some money. Even unicorn futurists need to eat.